Performance Rights Organizations (PROs) collect royalties on behalf of songwriters and copyright owners when their works are publicly performed. Public performances include broadcast on television and radio (including internet radio), live performances, playing recorded works in a public venue – such as a cafe or bar, and some internet uses (generally streaming). In the United States, the PROs that collect public performance money on behalf of composers and publishers are ASCAP, BMI and SESAC. 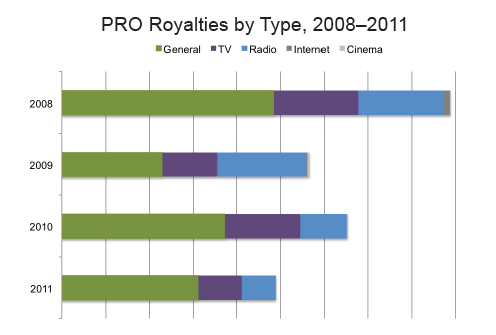 The rates for public performance use of compositions in the US are regularly renegotiated between the PROs and the users of music (broadcasters, venues etc). The PROs in the USA have reciprocal agreements with PROs in other countries so they can collect for public performance uses of compositions on behalf of the composer and publisher worldwide. 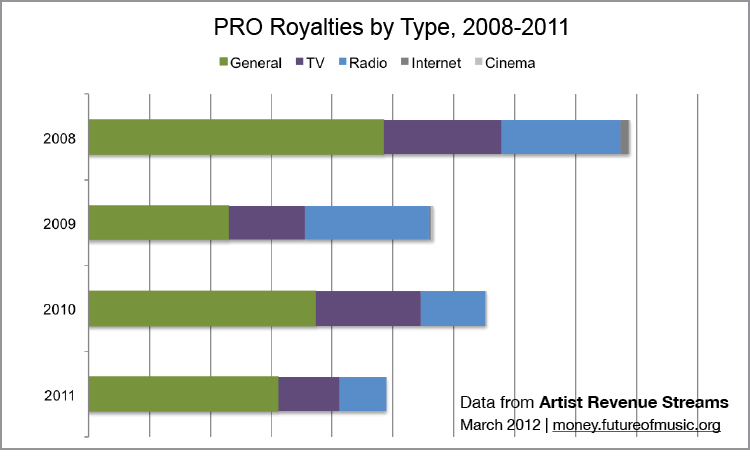 This chart shows Indie Rock Composer-Performer’s public performance royalties from the US and abroad, broken down by category. 96% of these royalties are income from his share of writing credits for Main Band #1. The “General” category, which includes use of the music by nightclubs, restaurants, concert halls, hotels, and live performances of the Artist’s compositions in UK and European countries, make up the bulk of the royalties. 96% of his PRO income is generated by songs he wrote for Main Band #1. General 54.5% 40.6% 57.1% 63.7% Use of music by nightclubs, restaurants, concert halls, hotels, etc. This also includes live performances of the Artist’s compositions in UK and European countries – which make up the bulk of the uses for this Artist. Television 21.8% 22.3% 26.4% 20.6% Use of recorded songs on TV (accompanying sports footage, direct license to shows, incidental music) and music licensed to or composed for films with TV broadcast of those films. Also, live performances of the Artist’s compositions on television. * Copyright is complex, and the work PROs do is greatly simplified here. You can learn more about the PROs here: ASCAP, BMI, and SESAC.